Malwarebytes’ Anti-Malware – The Best Free Security Application? When a free application is downloaded over 45,000 times from your site, like Malwarebytes’ Anti-Malware has been at my site, you just have to know this application is a winner. The free version of this speed demon (it’s faster at scanning than any anti-malware program I’ve tested in the last 2 years), is used by millions of people worldwide to protect their computers. I run Malwarebytes’ Anti-Malware every day, as a secondary malware scanner, since I have absolutely no faith that a single security application offers adequate protection. Depending on a single security applications to provide the ultimate in protection, is an absolute “non-starter”. A single security applications does not, and never has had the ability to this, despite the commonly help belief to the contrary. It’s important to note that the real time protection module is disabled in the free version of Malwarebytes’ Anti-Malware. Less critical, is the disabling of scheduled scanning, and scheduled updating in the free version. Each day as I manually update the definition database I’ve noticed that typically, the definition database has been updated 3/5 times in the previous 24 hours. Since study after study indicate that new malware is created at the rate of 20,000 new versions every single day, it’s easy to see that Malwarebytes’ is being proactive to these conditions. A simple, intuitive, and easy to use interface, makes Malwarebytes’ Anti-Malware straightforward to setup, customize and run, for both less experienced and expert users alike. Since real time protection is disabled, I would not recommend that you use this free version of Malwarebytes’ Anti-Malware as a stand alone primary security application, since it simply will not offer you adequate protection with this restriction. Instead, use it as I do, as an on-demand, secondary scanner. Despite this real-time protection limitation in the free version, Malwarebytes’ Anti-Malware has an excellent reputation (shared by me), as a first class security application, for its ability to identify and remove adware, Trojans, key-loggers, home page hijackers and other malware threats. 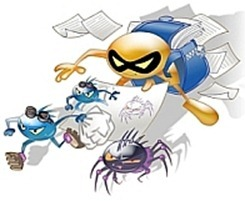 Numerous users of this Blog, have commented on Malwarebytes’ Anti-Malware’s ability to deal with one of the real scourges currently making the rounds on the Internet; rogue security applications. As a full fledged security application, with all of its features unlocked; real-time protection, scheduled scanning, and scheduled updating, Malwarebytes’ Anti-Malware is a terrific value at $24.95 US. Full scans for all drives. Quick summary: Discovered malware, including 3 Trojans, not found by SpyBot, or AVG, on a recent test on my test bed systems. Systems Requirements: Windows 2000, XP, Vista, Windows 7. Multi-lingual support: English, Albanian, Bulgarian, Catalan, Chinese Simplified, Chinese Traditional, Czech, Danish, Dutch, Finnish, French, German, Hungarian, Italian, Norwegian, Polish, Portuguese, Romanian, Russian, Serbian, Slovak, Slovenian, Spanish, Swedish, Turkish. There is no one anti-malware tool, that is likely to identify and remove, all of the malware that infests the cyber world. To ensure maximum safety, it’s important to have layered defenses in the ongoing fight against malware. In other words, it’s necessary to have front line line active malware defenses which provide real time protection, coupled with a secondary malware scanner which should be employed on a regular basis, I recommend a minimum of once a week, to ensure your computer stays clean. The free version of SUPERAntiSpyware despite it’s lack of real-time protection deserves its reputation as a first class security application, and it’s definitely worth considering adding to your security toolbox as a secondary line of defense. You can read the review, and find the download link in my article “Knockout Malware With SUPERAntiSpyware Free Edition”, on this site. Make that £19.50, including a hefty German 19% VAT. I might have paid up to £15 for it, but 19.5GBP is too much. I’m also a huge Malwarebytes fan! Although I don’t run it daily, I do run it weekly as part of my “weekly system cleanup” routine. This program is particularly good – no GREAT at detecting nefarious nasties. Highly recommend!! As you know, I use SUPERAntiSpyware Professional, Avast Antivirus (free), Threatfire (free) and Malwarebytes Anti-Malware (free). Since I have had these programs running together, and they run without a problem, I haven’t had a single infection. Thanks for all the great advice, Bill. PS, I forgot, I run windows vista built in firewall as my only firewall. I run Malwarebytes especially in the safe mode, handy to find sticky malwares, but the speed is not great, superantispyware is faster. Is there any licence giveaway in the near future Bill. No, No plans just yet. Just used this to clean a PC of malware. Like Azziz, I use it in “Safe Mode” to do the job. It can be on the slow side; however, it is much faster than trying to manually remove malware. MBAM is one that I highly recommend to others as it has great detection and removal abilities, and the frequent updates make it a sure fire winner in my book. MBAM say that it is best run in Normal boot mode as everything loads up, but in some cases it is also necessary to boot into Safe Mode to scan and clean then reboot normally and rescan. Along with Superantispyware, they are two potent applications and users should have at least one of them installed and updated regularly. For me, MBAM does the job much quicker and adds to a layered security defense. Both applications will pick up what many others miss and the bonus is that MBAM also removes Registry changes as well as files and folders, quick, clean easy, what more could one ask for? Thanks Colin. Glad to hear that your experience with MBAM is similar to mine. Great observation on safe mode vs regular mode – a valuable insight. I agree with Colin about the running in safe mode, it came straight from the horses mouth one of the Malwarebytes VP’s stated it should never be run in safe mode if you want it to work properly. And I agree with you that it and SuperAntispyware are great protection. I add the new Microsoft security Essentials for my best of breed in free protection. Happy to hear you’ve added MSE.